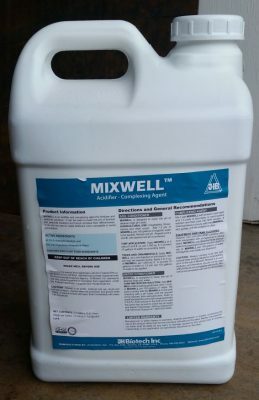 MIXWELL is an acidifier, buffer, and complexing agent for fertilizer and pesticide solutions. It can be used to lower the pH of fertilizer and pesticide solutions in tank mixes and hence increase their effectiveness. It can also be used to make fertilizers more compatible (esp phosphate) to avoid precipitation. Mixwell can also be used as a cleaning agent for equipment, including drip tape. Issues with compatibility of fertilizers in tank mixes, esp precipitation issues as a result of poorly compatible tank solution components or poor quality water. Rising pressures in drip irrigation systems may indicate emitter plugging. Mixwell can dissolve the precipitates that cause these problems. Especially effective when dealing with high alkalinity tank water. Calcium, iron, zinc and other nutrients often form precipitates with phosphorus in mixing tanks. MIXWELL can dissolve these precipitates in the spray tank and in drip systems and place them back in solution.